Level Field: Here we go again! Datuk Bandar Datuk Seri Ahmad Fuad Ismail announced on Friday that a new sports complex will be built to a tune of RM100 million in Ayer Panas, Setapak. I have no problems with sporting facilities built for the public close to their homes, especially with playing field diminishing fast in the name of development. My question is what is City Hall doing about all the many exiting complexes and playing fields which are in deplorable condition. And the Mayor's answer on public complaints of dilapidated sports complexes in the city, was shocking to say the least. Ahmad Fuad said the grouses were mainly on maintenance of the facilities. So what is City Hall doing about it. Is City Hall's job just to built the complexes. Another question for the Mayor - has there been any allocation been budgeted for maintenance of the complex to be built in Setapak? Or is it going to get into deplorable conditions after few years after it is officially opened because of wear and tear? In nearly all the Stadiums and complexes built around the nation, no budget is included for maintenance. Yes these Stadiums and complexes are suppose to generate enough income for maintenance, but how many of them are actually doing that. Just look around at the many Stadiums, complexes and fields' condition, and therein lies the answer - either poor management or not generating enough funds for proper maintenance. RM100 million is a lot of money to be spent on a sports complex! Would it not have been better to build a smaller stadium, but not compromising on the facilities and spend the money saved on repairing the many complexes which are fast being a sore-sight and a hazard to the users. 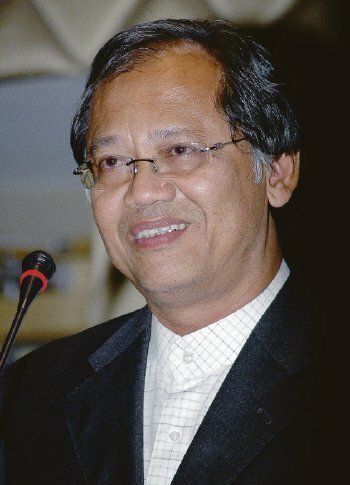 Datuk Bandar Datuk Seri Ahmad Fuad Ismail hopes the new sports complex in Ayer Panas, Setapak would be used to host national events such as the Malaysia Games in the future. KUALA LUMPUR: The ground-breaking for a sports complex in Ayer Panas, Setapak is expected to be carried out soon. Datuk Bandar Datuk Seri Ahmad Fuad Ismail said the complex, which costs about RM100 million, will be built on an 8ha land belonging to City Hall.It will have a multi-purpose hall, running track, basic amenities and a hostel. "Apart from providing recreational facilities to the public, we hope that the complex can be used as a venue for sports events in the future, including national events like the Malaysia Games (Sukma)," he said. "It may need two to three years to complete and will be accessible and affordable to the public. "It is learnt that the complex, to be named 1Malaysia Sports Complex, would be built on a vacant land near the Sekolah Menengah Perempuan Ayer Panas in Jalan Ayer Kuning 2. On public complaints of dilapidated sports complexes in the city, Ahmad Fuad said the grouses were mainly on maintenance of the facilities. Tell me what is new.....projects are created, whether needed or not....someone needs to make a living my friend!...thats how it works in boleh-land.